Congratulations to our newest success story, Angela Cook, who signed with Eric Myers of The Spieler Agency! We have one new agent this week in the QT database, Jen Linnan of Linnan Literary Management. Nine agent profiles were updated, including one who left agenting. You'll get better results if you don't query agents who have left the business, so please make sure you double-check every agent's website or Publisher's Marketplace page before querying. Not ours, but it's still a cool contest regardless (and the it's also reason the ineffable Janet Reid is currently closed to queries.) Check out the Liz Norris Pay It Forward Writing Contest, where you could win registration for Backspace, travel funds, and lunch with Liz Norris's agent. Check it out! It's been an interesting week for Amazon.com, with the SFWA dropping all links to the online retailer and many authors leaving after Amazon cut ties with the Independent Publishers Group. Digital Book World reports that publishers who are seeing print sales soften should be prepared for a steep drop, and lots of open shelf space. JK Rowling, whom you might have heard of, announced an upcoming novel geared toward adults. It is scheduled for release later this year. If you've ever thought of nudging an agent with a fake offer of representation, don't do it. As Kristin Nelson says, they can tell. Jessica Faust gives some tips about getting a job in the publishing industry. 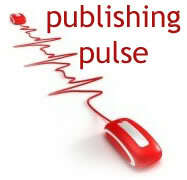 I always love the Publishing Pulse posts! Thanks for all the great info as usual!